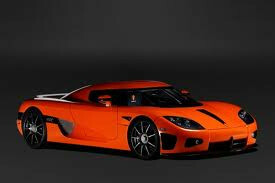 Created by Christian Koenigsegg and Michael Bergfelt, the Koenigsegg CC was a fearsome supercar. The prototype used a 4-litre Audi V8 engine but the production version was powered by a detuned Formula 1 engine. With 500bhp available from the Motori Modern flat-12 3.8 litre engine, a top speed of 220mph (354km/h) and a 0-60mph (97km/h) time of 3.1 seconds was claimed. Technically it featured a 7-speed gearbox, double wishbone suspension all round and race-derived carbon-fibre ventilated disc brakes. The dramatic bodywork, with its detachable roof was made of carbon-Kevlar honeycomb and incorporated competition-derived twin Venturis for aerodynamic performance.